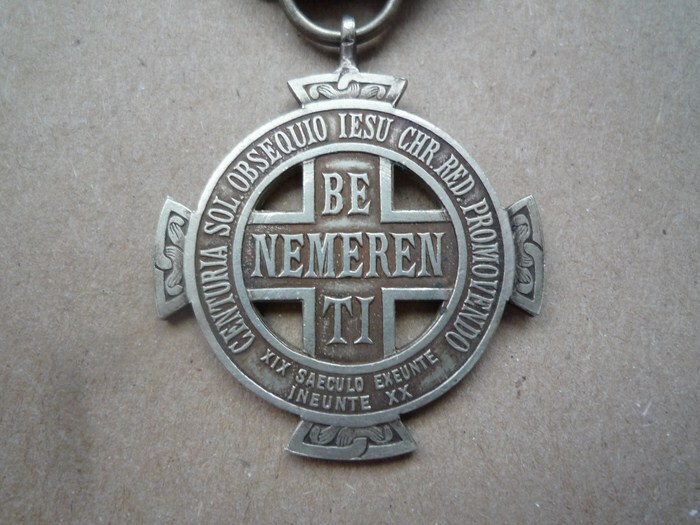 Would anyone have any background on this particular Benemerenti Cross? I've gone over several sources and can't find this particular example. Anybody?? I think it is a cross instituted by Pope Leo XIII during the Holy Year 1901, for long and faithful service to the Catholic church. Hope this helps you a little further in your search. Ribbon is a design & colors similar to that of the Medal of the Holy Land (image below) founded bu Leo XIII (Dec SCPF May 2, 1901) to commemorate pilgrimages. 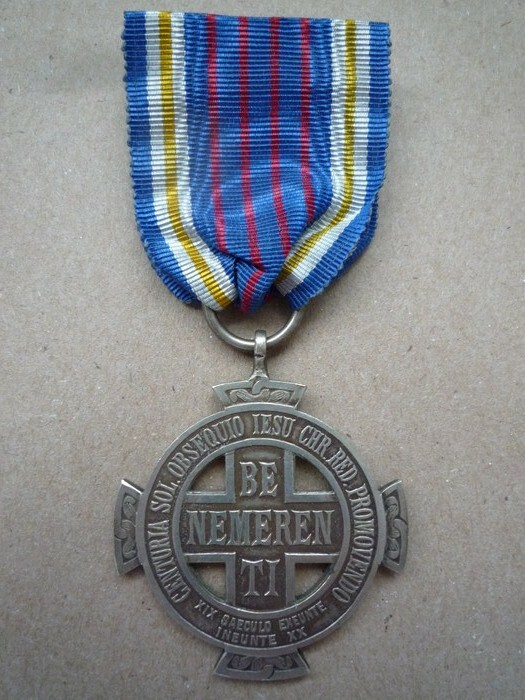 "The Benemerenti Medal was first awarded by Pope Pius VI (1775–1799) to recognize military merit. 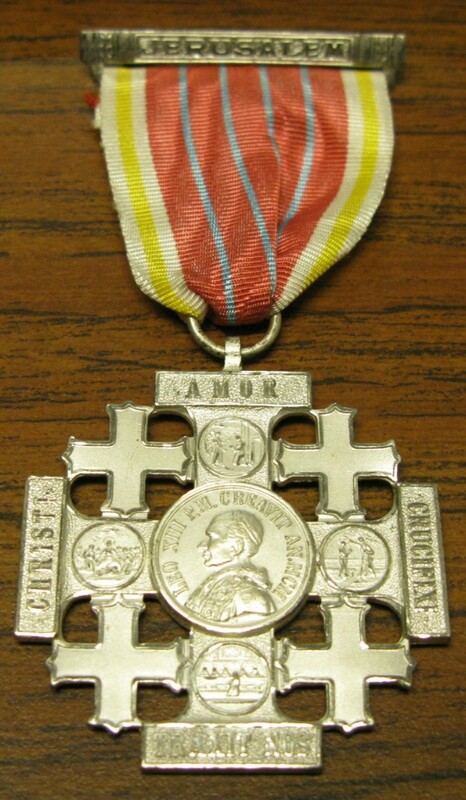 In 1831 under Pope Gregory XVI (1831–1846) a special Benemerenti medal was struck to reward those who fought courageously in the papal army at Ferrara, Bologna, and Vienna. 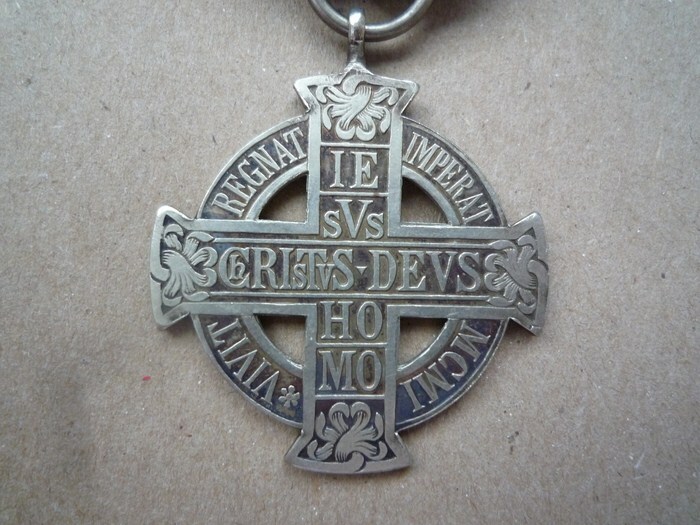 In 1925, the concept of awarding this medal as a mark of recognition to persons in service of the Church, both civil and military, lay and clergy alike, became acceptable. Members of the Swiss Guard may receive it for three years of faithful service." From this, I gather that prior to 1925 it was still considered an award for military merit/service? During years designated as a Holy Year/Jubilee, the Vatican sometimes creates special awards. Most sources do not provide useful information on these distinctions. The cross image that you originally posted is for a specific, limited scope 'Holy Year' decoration usually awarded for special services during that time. A similar in purpose award was created and used for the 1950 Holy/Jubilee year [image below]. Herbert Thurston's The Holy Year of the Jubilee [st. Louis, 1900--likely available on line at http://books.google.com] provides a good overview of Holy/Jubilee year 1900 activity and events. Do not remember if Thurston describes the cross you first posted. Thanks. It clarifies matters to a degree.